The annual Bulletin of the American Meteorological Society (BAMS) special issue on the attribution of last year’s extreme weather events is published today. 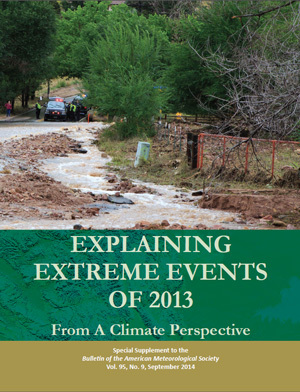 This year’s issue “explaining extreme events of 2013 – from a climate perspective” includes two papers led by researchers from our climateprediction.net team. This is a highly-cited and influential annual publication coined in 2012 asking whether and to what extent anthropogenic climate change altered the risk of major extreme weather events of the past year to occur. The first of these papers, led by Dr Nathalie Schaller, looked at the heavy rainfall last summer in the Upper Danube and Elbe Basins in central Germany. Nathalie explains her research: “Using the weather@home project, we performed two types of experiments to investigate the effect of human influence on the heavy precipitation event that occurred in May-June 2013 in Central Europe and led to floods along the Elbe and Danube rivers. Comparing extreme rainfall amounts in the Elbe and Danube catchments in simulations of the ‘world as it happened’ and of the ‘world that might have been’ shows that human influence did not affect the risk of such an event happening. The second paper, by Dr Juan Añel Cabanelas and colleagues, looked at the extreme snow in the western Spanish Pyrenees during the winter and spring of 2013. The special issue comprises of 22 studies of 16 events that occurred in 2013 all over the world. A particular focus of 5 studies was the extreme heat in Australia, which forced the local meteorological services to design a new colour for the weather maps to display unprecedented heat. All found a strong increase in the risk of such record-breaking heat waves occurring in a warming world, with Knutson et al. showing that the annual mean temperatures in Australia in 2013 are impossible to simulate without global warming. In compiling different methods to answer the same research question and highlighting the strengths and weaknesses in these methods and gaps in our understanding these annual reports add considerably to the body of evidence of climate change. Download the full report from the American Meteorological Society website. Read coverage of this report on the NOAA website. Read the story about this publication in the New York Times.